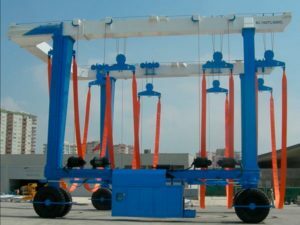 Travel lift is kind of special gantry crane. 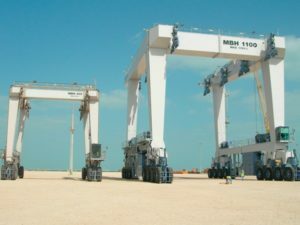 It mainly includes two types, marine travel lift and construction travel lift. The former type is more popular. 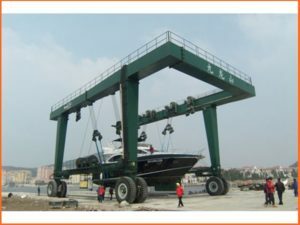 Travel hoist crane is mainly used for lifting boat from water, putting boat into water and transporting boat and maintaining boat on the land. 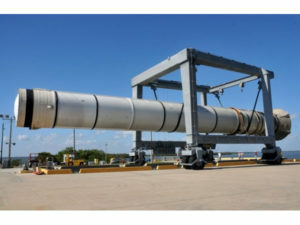 It is also used for transporting material with long size. Ellsen Group, a famous and reliable travel lift manufacturer in China, provides great boat hoists for sale, such as heavy duty travel lift, light duty travel lift, port used small travel lift boat crane, travel lift for water sport meetings, aquatic clubs, voyages, safe driving steady travel lift, factory price travel lift for sale, ISO approval marine boat hoist, remote control travel lifts, cabin control travel lifts and rubber tyre mobile travel lift boat hoist. 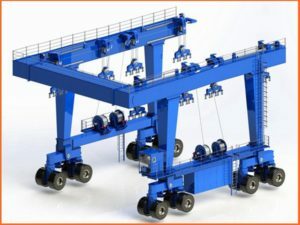 All these cranes have steady performance and affordable price! Ellsen travel lifts have been exported to countries and regions, and have won high praise and trust. Many customers purchase mobile travel lift cranes from Ellsen for many times! Reasonable design, great quality, factory price, Ellsen is a cost-effective choice! 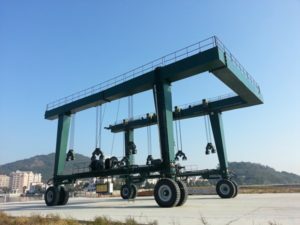 Travel lift is also called boat crane, mobile boat hauler, and boat transfer crane or boat travel lift. 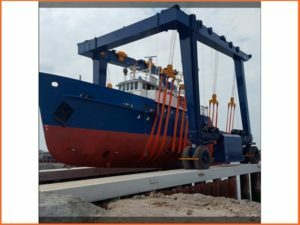 It is often used in shipyard, fishing port for the transfer of ship and vessels from dock to shipyard or warehouse and in turn. It is also applied in shipyard for building of boats. 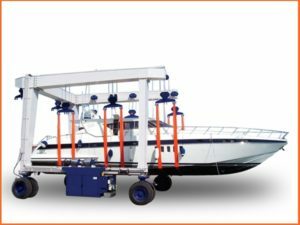 Boat hoist travel lift includes the following items: main structure, traveling wheel block, hoisting mechanism, steering mechanism, hydraulic transmission system, electric control system. 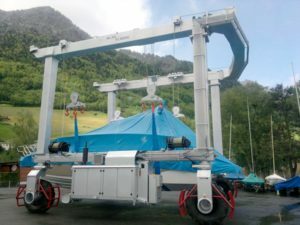 It can transfer the boat which the height surpasses its height. 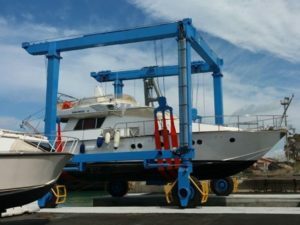 According to different requirements, boat hoist crane can handle different weight of boat or yacht (10t-1000t) from the shore side. 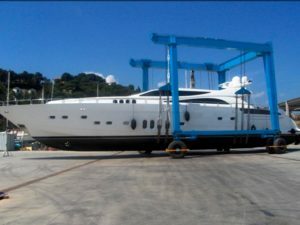 It can be used for the maintenance in yard and can put new boat into sea. It adopts the soft beltsto lift the boat against surface damage. The details include straight movement, transversal movement, 90 degree steering and 360 degree pivot steering. Ellsen portable boat hoist crane is designed as electric drive with diesel generator. It has higher performance and easier control. It is the best succedaneum for previous hydraulic mobile hauler in the market. Compared with hydraulic model, it lead to 40% cost reduce. 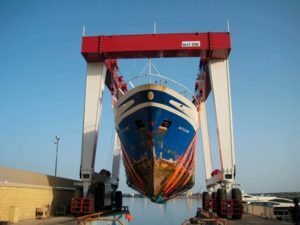 More customers change the previous choice and choose this type travel lift for shipyard marketing. 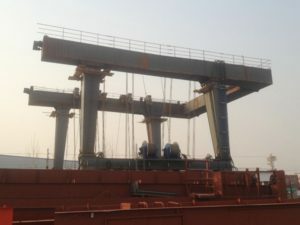 Ellsen can design mobile boat hoist crane based on the actual condition in shipyard. Reasonable design has advantages as variable frequency, intelligent control, fast installation and smooth shipping. Ellsen supplies the best installation, customized service and shipping solution to save cost for customers. 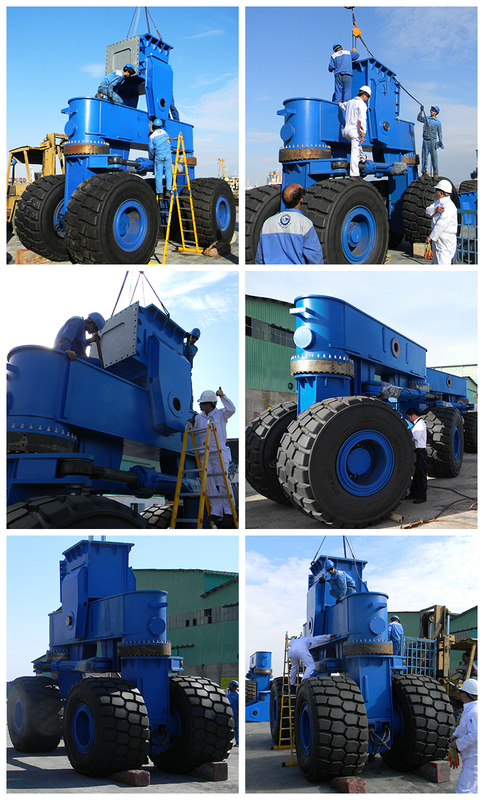 Travel lift is mainly applied for water field and land work. Different travel lifts are used for different occasions. 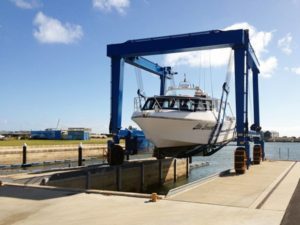 For marine boat hoist, it includes port used small boat crane, shipyard travel lift, straddle boat crane, yacht mobile crane hoist, dock travel lift, seaport vessel hoist crane, travel lift for water sport meetings, aquatic clubs and voyages. 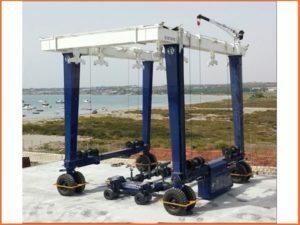 Construction travel lift can be used for transporting boat and maintaining boat on the land. 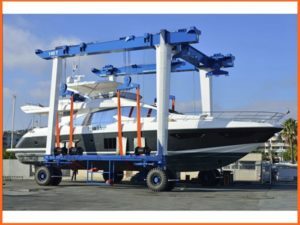 As a kind of dedicated hoisting machinery, travel lift is used to up and down water work of boat and level transportation. It is mainly used to ports along the coast. Its traveling mechanism adopts the wheel structure that can achieve 360 degree turn and run smoothly. The whole device is controlled by hydraulic and electric equipment. 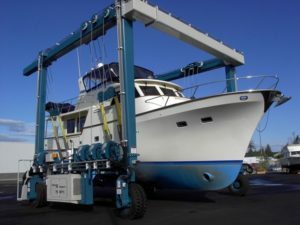 Popular travel lift is used for boat handling and transportation. 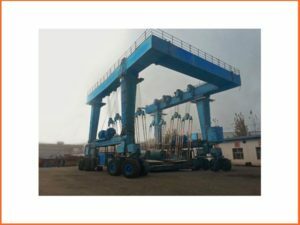 It is composed of main frame structure, hoisting mechanism, steering mechanism, hydraulic transformission system, electrical control system and wheelsets. The main structure is designed with open box shape. 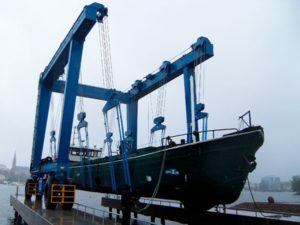 With high strength, it is able to transport boats that is much higher and longer than the crane itself. 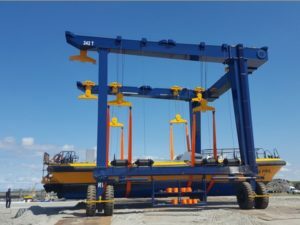 Electro-hydraulic transmission and electric system are both available for option in hoisting and traveling parts according to client’s demands. Hydraulic system has small volume, light self-weight, compact structure, smooth running, quick response, small inertia, easy operation and automation. 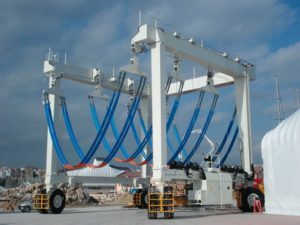 Electric hoisting system has outstanding cost-efficiency. The crane is able to take high speed start and turn. 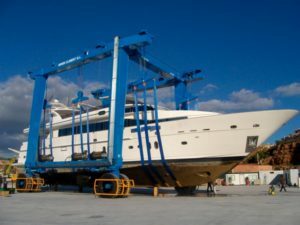 Multiple lifting points works simultaneously to avoid load skewness or strong pressure on the hull and possible damage or accident. 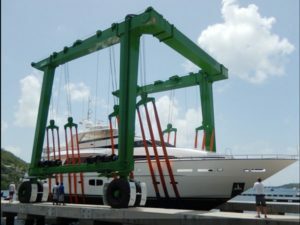 Space between hoisting points is adjustable to fit boats in different dimensions and automatically adjust the deflection angle for adaption. Pivot steering for maximum option of space and flexible work. 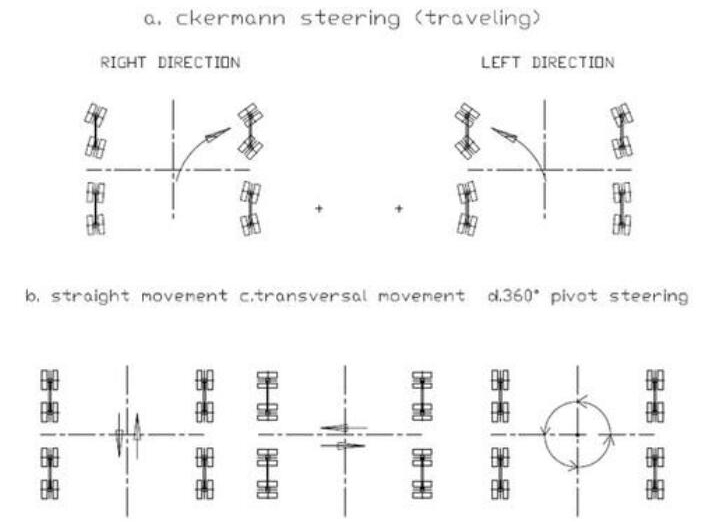 Acherman steering and stable steering. Radar anti-collision method makes operation safe and high efficiency. Adoption of load sensitive control technology enables the crane to produce output as actual demand to prevent energy wastes. Soft but sturdy hoisting belts make no damage on hulls surface. Rubber tyres as traveling mechanism make it convenient and flexible for operation without limit of rails. According to capacity, Ellsen travel lift can be divided into two types, light duty travel lift and heavy duty travel lift. 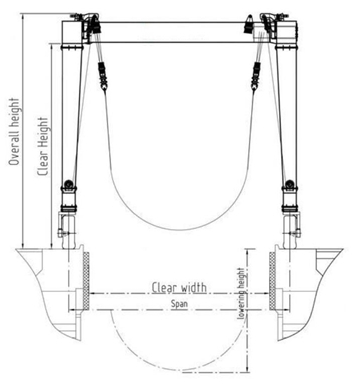 For light and frequent work, small boat hoist is more suitable, such as 10 ton travel lift, 25 ton marine boat hoist, 35 ton mobile boat crane, 60 ton boat hoist, 70 ton marine travel lift crane. 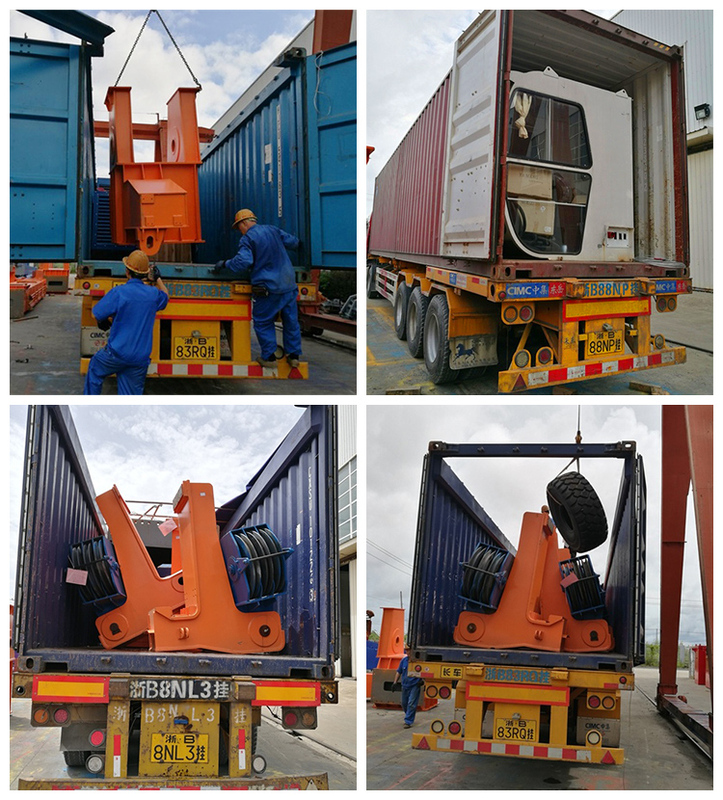 For heavy duty work, large travel lift is reliable, such as 100 ton boat hoist, 300 ton travel lift, 500 ton mobile boat lift gantry crane, travel lift 800 ton. 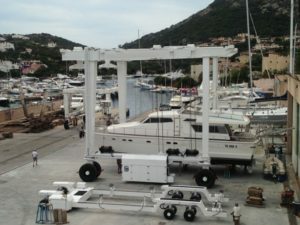 Boat hoist cranes move on the ground rather than on overhead runways, they don’t require runway structure, nor do they require concrete foundations. 1. Electric parts are packed by high quality plywood crate, to reduce distortion in delivering. 2. Main beams, end beams and electric hoist are packed by plastic woven cloth. It can reduce abrasion when transport. 3. 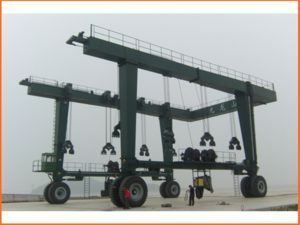 If the size of whole crane is suitable for container ship, usually by container. 4. If the size is too big, usually by bulk ship or by container after truncation. 5. 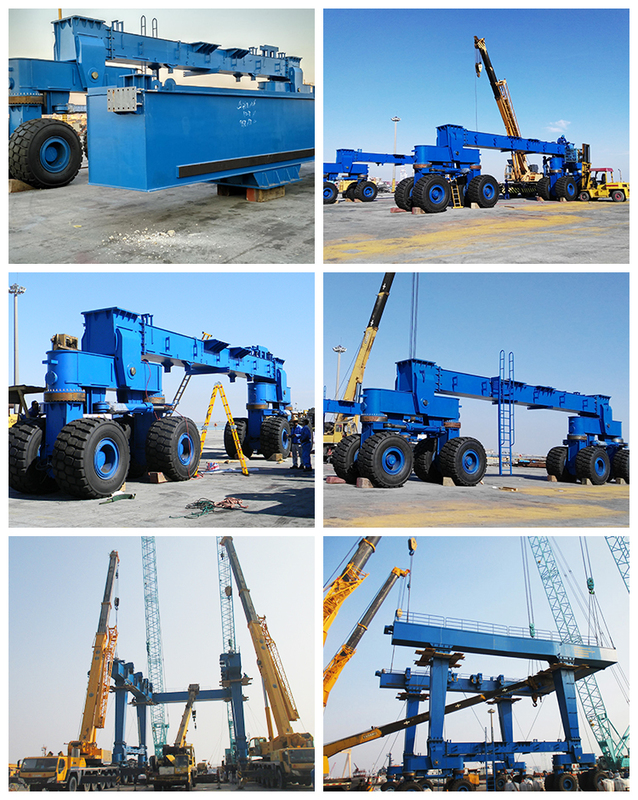 Transport ways are based on reducing cost for customers and keeping the crane performance. Compared with the same industry at home, Ellsen has more advanced processing equipment and processing technology. Ellsen takes the lead in the implementation of lean management, lean production, which achieves the maximum guarantee of product quality, the requirements of customers. 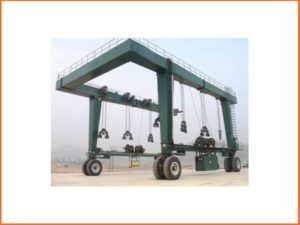 Ellsen Group mainly deals in researching, developing and producing the lifting machinery, such as travel lift, overhead crane, gantry crane, jib crane, electric hoist and marine winch. Ellsen has become one of the most competitive enterprise group with the largest production and sales volume and the most influential brand in China’s crane industry. Up to now, Ellsen travel lifts have been exported to more than fifty countries, such as America, Russia, Korea, etc.